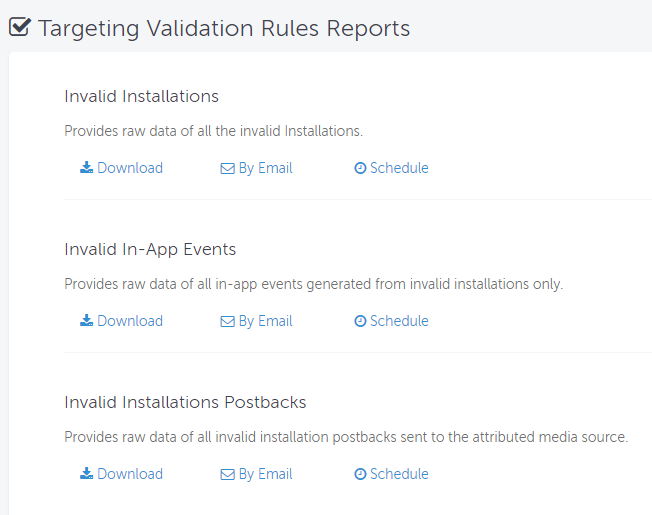 Validation Rules enable you to define when installs should or should not be attributed. 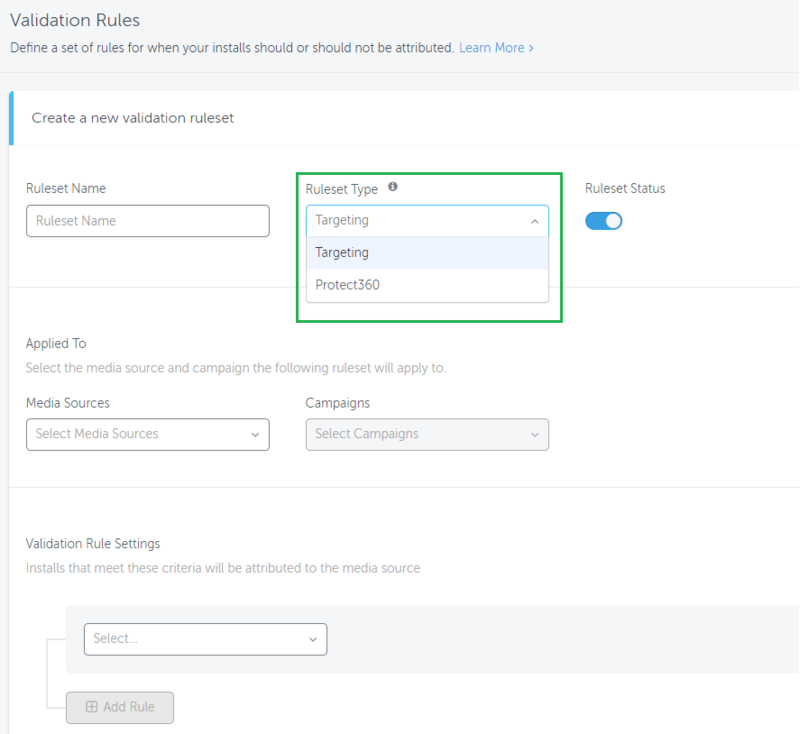 Validation Rules put you, the marketer, in control of the campaign – blocking attribution for installs that do not meet your defined targeting. In addition, it enables you to customize your fraud protection by changing certain automatic fraud protection parameter thresholds that block fraudulent activity relevant to your app and market behavior. A set of rules that allow you to enforce your targeting such as targeted Geo and Device Type. A set of rules that allow you to customize the Protect360 KPIs such as CTIT (Click To Install Time). 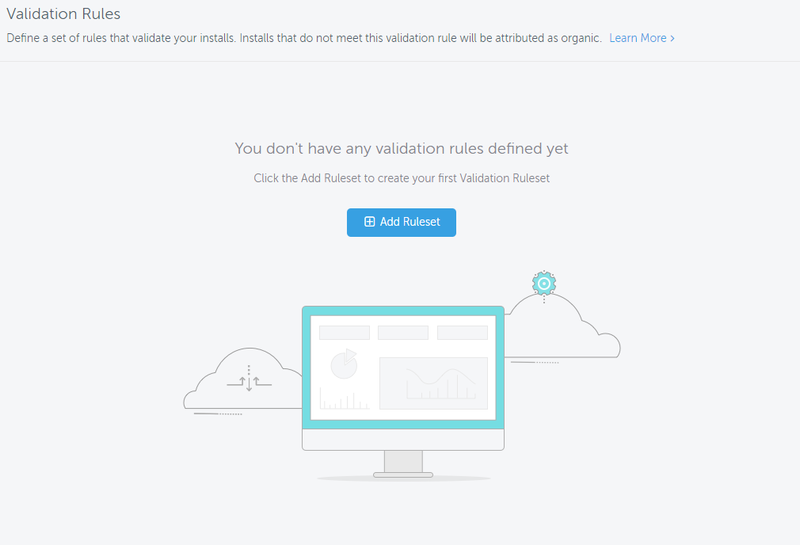 Follow these steps to configure your targeting validation rules. 4. Enter the Ruleset Name. Enter a meaningful name for the ruleset that describes the set of rules being configured, in particular the media source and the campaign to which the rule applies to. For example: Facebook US only. 5. Select Targeting as the Ruleset Type. 6. Select Ruleset Status to define whether you want the ruleset to be active or inactive once you have saved the configuration. (Blue indicates the status is set to active). 7. In the Applied To field, select the media source and campaign that the ruleset applies to from the drop-down menu. The media source and campaign appearing in the drop-down list are those that are considered active and have had at least one impression/click or install within the past month from a user acquisition campaign (not from retargeting campaigns). The media source drop-down list contains only direct ad networks, not agencies. When you select All in the Campaign drop-down list, the ruleset applies to all current active campaigns and all future campaigns. If you select multiple Media Sources, the campaign is automatically set to All. Meaning the ruleset applies to all current active campaigns and all future campaigns. When there are a number of different rulesets that can be suited to a specific network, the most specific Ruleset is applied. Ruleset 2: Media Source - Network_A, Campaign - C1 , Target US. Installs that should be attributed to Network_A, Campaign C1 pass ruleset 2 only. Installs that should be attributed to Network_A, Campaign C2 pass ruleset 1 only. Only one ruleset can apply per install. 8. In the Validation Rule Settings section, select the installs that meet the criteria to be attributed to the media source. Validation Rules apply to install conversion only. Then click + Add Rule. If you have selected Geo above, enter the country and city. AppsFlyer's Validation Rules may result in differences between AppsFlyer and self-reporting networks, such as Facebook. For details click here. The Device Type parameter is used to exclude unwanted device types with the usage of the Not Contains operator. This is calculated by exact string matching and is case insensitive. AppsFlyer's Raw Data reports include Device Type format in the same format as used with validation rules. You can enter multiple strings in the same field using a ';' separator. In most cases, the iOS Device Type convention is "[product type] [product model]". The full list of possible iOS device types is attached below. The current list of possible Android device types is attached below. Apple, being the sole manufacturer of iOS mobile devices, has a short list of device types. However, Android OS has tens of thousands of device types, with more being added daily. 7. Click Add Rule and continue adding the ruleset criteria. 8. Click Save to complete the ruleset configuration. The Rejected Reason and Rejected Reason Value fields are populated in both the Invalid Installations and Invalid In-App Events Reports. The Rejected Reason Value includes the Ruleset ID that caused the rejection. The Invalid Installs Report and Invalid In-App Events Report are also available for advertisers via the Pull API. Click here to read about the Pull API. This configuration is only available to Protect360 customers. To enable this feature, contact your CSM for more details. Follow these steps to configure your Protect360 validation rules. 5. Select Protect360 as the Ruleset Type. When you select All in the Media Source, the ruleset applies to all current active media source campaigns and all future campaigns not including self-reporting networks and agencies. The media source and campaign appearing in the drop-down list are those that are considered active and have had at least one impression/click or install within the past month. The media source drop-down list contains only direct ad networks, not including self-reporting networks and agencies. Installs that should be attributed to Network_A, Campaign C1 pass ruleset 3 only. Installs that should be attributed to Network_A, Campaign C2 pass ruleset 2 only. Installs that should be attributed to Network_B, Campaign C3 pass ruleset 1 only. Only one ruleset can apply per install. If the rules does not exist, the install does not pass another ruleset and the automatic Protect360 prevention rules apply. You can configure up to 20 CTIT rules in the same ruleset. Blocked installs are shown as blocked traffic in the Protect360 dashboard. Blocked installs due to validation rules are shown under the Blocked Installs Breakdown - CTIT Anomalies column of the Blocked Activity Table. For details of the fields available in the Blocked Activity Table, click here. Blocked installs from Protect360 Validation Rules are reported in the Protect360 Blocked Fraud Reports. The Blocked Reason Rule column of the Blocked Reports includes the Ruleset ID and the exact validation rule that caused the block.